Introduction: Research in medicine has an impact on prevention, diagnosis, and newer treatment for the medical ailments. It has brought reforms in policies for health-care programs. Involvement of undergraduates in research was less, so this study was planned to determine the factors and their perception toward the same. Objective: The objective of the study was to evaluate knowledge, attitude, experience, and the barriers of research among medical undergraduates. Materials and Methods: A cross-sectional questionnaire-based study was conducted after the protocol was approved by the Institutional Ethics Committee and obtaining written informed consent from participants. The predesigned validated questionnaire containing 34 questions was used. Filled questionnaires were received from the medical undergraduates of different phases of MBBS from our institute. Data were analyzed using descriptive statistics. Results: A total of 89% (267/300) responded, 140/267 were females. The knowledge score regarding the concept of research and its methodology was 2405/3458 (70%). Sixty percent strongly agreed to include research in undergraduate curriculum, 57% believed that it would facilitate better understanding of the subject and clinical practice (41%). Nearly 56% opined that research was not waste of time and does not interfere in studies. Barriers for research were lack of awareness (53%), interest (54%), funds (62%), time (59%), and difficulty in follow-up of patients (67%). Almost 59% of students disagreed to lack of encouragement by faculty. Conclusion: Most of the participants had knowledge regarding research and expressed positive attitude toward involvement in research activity. Some of barriers were lack of awareness, time, funds, and difficulty in patient follow-up. The concern toward scientific research has increased in both developing and developed countries because biomedical research can improve medical care. The updated knowledge of scientific principles and methods is essential for the conduct of research. The medical students should be aware of the methods in carrying out research as they will be future doctors who will have to practice evidence-based medicine in patient care. Scientific research is the systematic approach by which theories and hypotheses can be proved or disapproved. In the medical college, undergraduate involvement in research was less because of their vast curriculum, less exposure to research methodology, and lack of time. When these students get into their postgraduation, their ability to write a protocol or proposal is not up to mark. Some of the regulatory bodies encourage undergraduates and postgraduates to carry out research by providing grants. In spite of these facilities by the regulatory organizations and the institutes to increase the research by undergraduates, there is lack in the research quantity and quality. Adequate knowledge and positive attitude toward research is an essential component toward increase of research among them. This study intended to assess the knowledge, attitude, experience, and barriers toward research among the medical undergraduates. This was a cross-sectional questionnaire-based study which was conducted by the Department of Pharmacology, Sri Devaraj Urs Medical College affiliated to Sri Devaraj Urs Academy of Higher Education and Research, Tamaka, Kolar. The study protocol was submitted to the Institutional Ethics Committee. After obtaining approval, the study was carried out from March to August 2017. All the undergraduate students from first to final phase of MBBS who were willing to participate in the study were included after obtaining written informed consent. The responses with more than three questions being unanswered were excluded from analysis. A predesigned validated, questionnaire was used to assess the knowledge, attitude, experience, and barriers toward research among them. The questionnaire consisted of 34 questions of open- and close-ended types. Self-reporting, 2-page questionnaire was distributed to the students by the researcher who briefed about the purpose of the study and mentioned that it is not compulsory to participate in the study. The undergraduates willing to participate and give written informed consent were able to consult the researcher who remained present to answer the queries related to the questionnaire. The filled questionnaires were collected as they completed answering it and participants were assured that the information collected will be used for the research purpose and will be kept confidential. The questionnaire was prepared by literature review and in consultation with senior faculty to make necessary changes according to our requirements. First part of the questionnaire was regarding demographic details such as age, gender, and year of the study. The second part consisted 13 questions (both open and close ended) on knowledge of research such as various study designs, hypothesis, protocol writing, and regulatory bodies. It was assessed by scoring 1 to the correct response and 0 for incorrect response. The maximum score was 13 and minimum being 0. The total score was calculated in the end by valuating the answers. Third section of questionnaire was intended to collect information on the attitude and experience of the participants in research. The answers were evaluated by 5-point Likert rating scale ranging from strongly disagree (score 1) to strongly agree (score 5). The attitudinal statements were reported in the range of +1 to −1. The center 0 corresponds to neutral response on Likert scale (neither agree nor disagree), +1 corresponds to totally agree and agree, and −1 corresponds to totally disagree and disagree. There were five attitude statements in the questionnaire so that the maximum score was +5 and the minimum score was −5. A mean score of for all studied attitude statements was then calculated from individual scores. The experience of research among student was assessed using open-ended questions. It was centered to know regarding their interest and preference in research. The information on previous experience in research such as scientific presentations, publications, and their motivation to continue in research field was collected. The barriers toward research were assessed in the last part of the questionnaire consisted of 6 statements. The responses were evaluated by 5-point Likert rating scale ranging from strongly disagree (score 1) to strongly agree (score 5). The questions addressed the concerned limitations on the research such as poor awareness, lack of self-interest, inadequate funding, lack of encouragement by faculty, time constrains, and follow-up difficulties. The questionnaire was self-designed after literature search and relevance was verified by senior faculty and colleagues. The understandability was checked by administering the questionnaire to undergraduate students. The questions were modified according to the suggestions. The reliability coefficient was accessed by Cronbach alpha which was 0.84 for knowledge, 0.74 for attitude, and 0.77 for barrier. The data were entered in Microsoft excel spread sheet and were presented using frequencies, mean, and standard deviation as appropriate. Categorical data were represented as frequencies. The student's knowledge score based on gender was analyzed using Fisher's exact test and attitude between the year of study was analyzed by two-way ANOVA followed by post hoc Tukey's test. P ≤ 0.05 was considered statistically significant. The statistical analysis was done using GraphPad software online (GraphPad Prism version 7, QuickCalcs) and SPSS version 20, IBM SPSS Statistics for Windows, Version 20.0. IBM Corp., Armonk, NY, USA. The response rate in this study was 93.3% (140/150) among female students, 84.7% (127/150) among male students, and total response rate was 89% (267/300). The demographic data are represented in [Table 1]. The total knowledge score regarding the concept of research and its methodology was 2405/3458 (70%). The total knowledge score of all the students was as follows: first (63%), second (78.8%), third (67.6%), and final (70.6%) year students. The comparison of knowledge score based on gender is depicted in [Table 2]. [Table 3] shows the distribution of the participants according to the attitude scale and [Table 4] shows the average attitude score among the participants by their characteristics. The reason for involving in research as opined by participants was their own interest (54%), facilitate foreign competitive examinations (36%), and peer pressure (10%). They preferred doing research in small group (64.7%) or individually (35.3%). The students' experience of presenting paper in scientific forum was 5% and publication 5.6%. The details of students motivated to do another research project are given in [Table 5]. There was no significant difference among the motivated students based on gender. Among the total motivated students, most were from 2nd year (65.6%), followed by 1st (38.3%), 4th (31.4%), and 3rd year (14%). The participants expressed improve knowledge (90), clinical practice (21), and improves analysis and lateral thinking (10) as some of the advantages of research. The participant's opinion on barriers for research is shown in [Figure 1]. Research is an important element in the advancement and upgradation of health-care system which is accessible to general population. To carry out research adequate knowledge, a positive attitude and acceptable skills are required., We intended to assess the knowledge, attitude, practice, and barriers to research among the undergraduate students of Sri Devaraj URS Medical College. Among the approached undergraduates, nearly 90% showed interest to participate in the study. The total knowledge score among them was encouragingly good (70%). This finding was similar to another study done on undergraduates in Saudi Arabia which showed good knowledge regarding research. The overall knowledge scores were higher among females and the difference was significant among the 2nd-year students. The total knowledge score was better in 2nd-year students (78.8%), followed by final year (70.6%), 3rd year (67.6%), and 1st year (63%). This finding was in contrast to a study done on undergraduates in Saudi Arabia and America which reported the increase in knowledge among students according to their advanced academic year., Few studies done on postgraduates and undergraduates in Iran, Arabian Countries, Australia, and Pakistan shows that the attitude and knowledge of the participants did not improve increasingly with their academic years.,,, Most of the students felt the importance of research in clinical practice and agreed to spend time for research. This finding was similar to the study done in South Africa reported the importance of research interest by most of the participants. The attitude score of the students was better with the advancement of their academic year except 3rd-year students who had low attitude score compared to other year students. The reason could be the reward and encouragement by faculty for students involved in research which improved their attitude toward it. The 3rd-year students have less time for academics as they are involved with organization of various events in the university, and this could have been the reason for their reduced attitude. This finding was similar to the other studies who have also reported better attitude score with seniority.,, A study conducted among undergraduates and postgraduates in Iran showed a contrast findings; there was decline in the attitude of the students with increasing academic year, with postgraduation and marriage. The reason for the reduced attitude among them is explained due to increased burden of studies, workload, and marital responsibilities. Most of the students expressed that their involvement in research was due to interest followed by reward in foreign competitive examinations and peer pressure and many of them wanted to do research in small groups which represents their positive team culture. Research is motivating when done in small groups as it enables them to share their thoughts and ideas and discuss different perspectives in research. A study done in Sudan had similar findings and suggested that research is preferred in teams. The paper presentation and publication was meager by students. As they advance academically their priorities change and they get exposed to different facilitators and subjects, so most of them do not complete their project. A study done in India on resident doctors had similar findings among postgraduate students. Despite positive attitude toward research, the participation in research, presentation of paper, and publication were less. Some of the universities in India have made mandatory paper presentation and manuscript sent for publication for postgraduates as a part of curriculum, due to which the number of presentations and publications has increased. However, it is not mandatory for undergraduates to involve in research. A few studies have shown that the prime motive of doing research was because of mandatory research in curriculum. Low proportion of students wanted to pursue their career in research as the monetary benefit is less compared other fields in medicine.,, Students could get motivated when exposed to the research centers of national importance. Interactions of students with eminent research scholars and work done by them could influence them. Our study showed that, in spite of moderate positive attitude, the students had poor motivation to take up another project. Third-year students were least motivated compared to others. Majority of students opined that research improves their knowledge and facilitates them to understand the subject in depth. 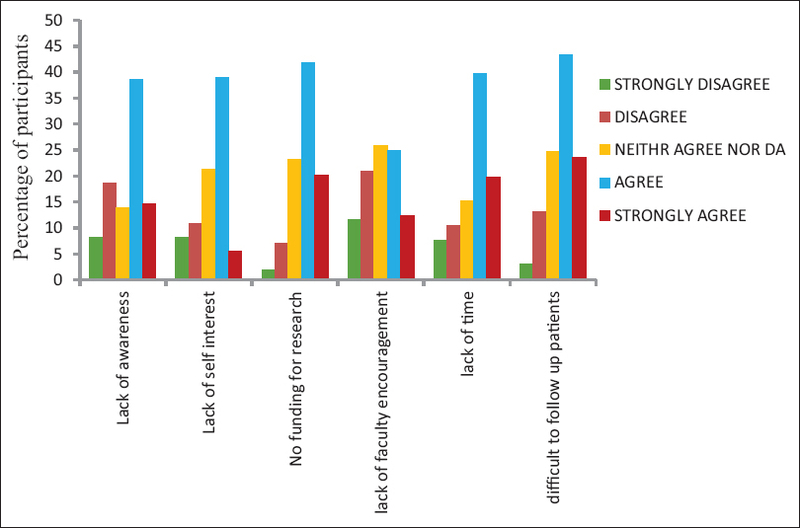 Barriers for research were lack of awareness (53%), interest (54%), funds (62%), time (59%), and difficulty in 4ollow-up of patients (67%). In the current study, the major barrier as opined by students were inadequate financial grants to carry out research followed by difficulty in follow-up of patients, lack of time, interest, and awareness regarding research. Studies from Arabian countries, Canada, and Pakistan have reported similar findings regarding barriers of research.,,,, Few students felt that there was a lack of encouragement by faculty as most of the students opined having adequate motivation and support by faculty to carry out research. There are meager studies in India regarding opinion of undergraduates on research. This study was an effort to know their knowledge and attitude regarding the same. Our study reports that, in spite of favorably good knowledge and attitude toward research, the number of completed projects, presentations, and publications were handful. The undergraduates should be exposed to the research methodology at regular intervals as it an ongoing process for undergraduates. The students who complete their studies should be encouraged to present in undergraduate conference and publish their work by providing incentives. All the faculties should be trained in research methodology and encourage their students to take up projects. The interested students should be involved as coinvestigators in projects taken up faculty. We observed that the 2nd-year and 1st-year students had better knowledge and attitude toward research as they were encouraged by faculty to involve in student projects sponsored by external funding agencies along with the internal funding by our university. The study reports are limited to the university. These findings should be conveyed to students so as to encourage them to know about their knowledge and perception. The barriers need to be discussed at the administrative level to bring in changes to reduce the obstacles faced by students. The selection bias may be a major limitation of this study as only the participants who were willing to be a part of the study were included. Most of the participants had knowledge regarding research and expressed a positive attitude toward involvement in research activity and females being more than males. Some of barriers were a lack of awareness, time, funds, and difficulty in patient follow-up. Encouragement by faculty was adequate as opined by students. Research by students can be improved if the barriers can be addressed by faculty and administrators. Vujaklija A, Hren D, Sambunjak D, Vodopivec I, Ivanis A, Marusić A, et al. Can teaching research methodology influence students' attitude toward science? Cohort study and nonrandomized trial in a single medical school. J Investig Med 2010;58:282-6. Memarpour M, Fard AP, Ghasemi R. Evaluation of attitude to, knowledge of and barriers toward research among medical science students. Asia Pac Fam Med 2015;14:1. Lavis JN, Oxman AD, Moynihan R, Paulsen EJ. Evidence-informed health policy 1 – Synthesis of findings from a multi-method study of organizations that support the use of research evidence. Implement Sci 2008;3:53. Amin T, Kaliyadan F, Abdulatheem EA, Majed M, Khanjaf H, Mirza M. Knowledge, attitudes and barriers related to participation of medical students in research in three Arab Universities. Educ Med J 2012;4:e47-55. Burgoyne LN, O'Flynn S, Boylan GB. Undergraduate medical research: The student perspective. Med Educ Online 2010;15:1-9. Park SJ, McGhee CN, Sherwin T. Medical students' attitudes towards research and a career in research: An Auckland, New Zealand study. N Z Med J 2010;123:34-42. Chakraborti C, Bourgeois DJ, Gleeson E, Gunderson W. Identifying barriers to successful research during medical school. Med Educ Dev 2012;2:1-7. Khamis N, Ibrahim R, Feyani DM. Assessment of the research oriented knowledge, attitude and ractice of medical students and interns of the King Abdulaziz University, Jeddah and the adoption of a research intervention education program. RML 2013;38:432-9. Siamian H, Mahmoudi R, Habibi F, Latifi M, Zare-Gavgani V. Students' attitudes towards research at Mazandaran University of medical sciences in 2015. Mater Sociomed 2016;28:468-72. Askew DA, Clavarino AM, Glasziou PP, Del Mar CB. General practice research: Attitudes and involvement of Queensland general practitioners. Med J Aust 2002;177:74-7. Nel D, Burman RJ, Hoffman R, Randera-Rees S. The attitudes of medical students to research. S Afr Med J 2013;104:33-6. Osman T. Medical students' perceptions towards research at a Sudanese University. BMC Med Educ 2016;16:253. Sabzwari S, Kauser S, Khuwaja AK. Experiences, attitudes and barriers towards research amongst junior faculty of Pakistani medical universities. BMC Med Educ 2009;9:68. Mowla A, Nabavizadeh SA, Bajestan MN, Tavakoli A, Seifi A, Tavakoli A, et al. Payment as motivator in Iranian medical students' attitudes toward research. South Med J 2006;99:1403.